Sujatha, the grand daughter of former Chief Minister of Travancore, late Parur T.K.Narayana Pillai, started her music career way too early, when other kids her age were caught in mundane grind. Her debut was with Padmasri Dr K.J.Yesudas and she has performed in over 3000 stage shows all over the world with him- no mean task! She did not give up on her studies despite her runaway success in music… she is a graduate in economics and is an A.I.R graded artist. Sujatha's stint in playback singing began in the year 1974 with the Malayalam movie ‘Tourist Bungalow'. Her seamless music pervaded into Tamil films too; she arrived with a bang as a coveted debutant- with Maestro Illayaraja for the movie ‘Kavikuyil'. Her hits ran on…. ‘Gayathri' and 'Johnny'. After a short break, Sujatha re-entered filmdom with A.R.Rahman's path-breaking ‘Roja' and there has been no looking back. Her calibre and immense versatility has enabled her to work with all the leading music directors of South India- M.S.Viswanathan, Ilaiyaraja, A.R. Rahman, Harris Jeyaraj, Vidyasagar, Deva, Mani Sharma, Jayachandran, Bharadwaj, Sirpi, Adityan, Raj-Koti, Hamsalekha, V.S. Narasimhan, Raveendran, Johnson, Shyam, Salil Choudhury, Ouseppachan, S.P.Venkatesh, Mohan Sithara, Karthik Raja, Yuvan Shankar Raja and Vishal Bharadwaj among others. 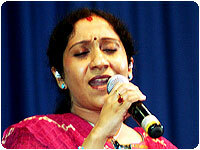 South Africa , U.A.E., Srilanka , Singapore and Malaysia.She has featured in several devotional and private albums including ‘Kadhal Vedham' with Hariharan. Her "single" in Hindi for Lez Lewis' ‘Bheegi Bheegi', has received wide acclaim from music channels like MTV and Channel V.